Style a suave yet relaxed look in this A-line dress from Marie Claire. 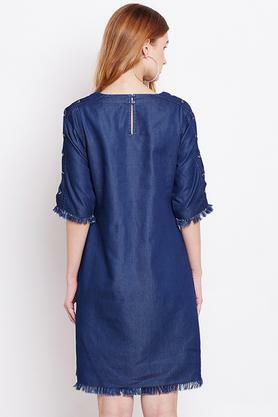 Made of denim fabric, this dress is also extremely soft against the skin. Featuring a round neck, elbow sleeves and solid pattern, this dress possesses a stunning polish. Lend your smart casual collection the addition of this A-line dress. Team this dress with a pair of heels for a stylish look.